I am so excited to share with you January's brand new digital stamps and Exclusive Club Digi! I went with a Valentine theme since Valentines Day is just around the corner! I hope you like all the new images! 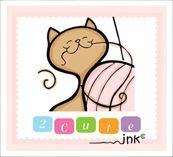 You can find all 5 digital stamps in my 2cuteink etsy shop or you can join the 2 cute ink digital stamps club and get all 5 digital stamps plus a bonus exclusive design! You can find out more about the 2 cute ink club here!